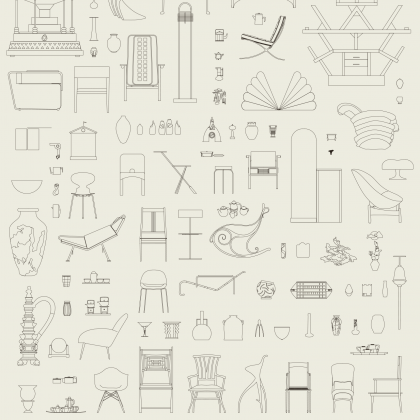 Object Stories offers a new look at the richness of Belgium’s largest design collection. The presentation features some 200 objects from 1805 until today. It combines both highlights and favourites chosen from a historical and personal perspective by various museum staff members. The collection pieces do not serve a theme or a chronological macro-history. Instead, the objects themselves attract the attention, as individual narrators of stories and meaning. Because they are everyday objects, design objects often escape our attention. Here, in the context of a museum, they invite you to take a close look at them. An object incorporates several meanings. At the start of Object Stories you can choose one or five layers of meaning as your guiding principle. Each route looks at ten objects from a certain perspective. Alternating layers of meaning enable the visitor to experience and read the presentation and the collection pieces in different ways. Who commissions objects and why do they do so? Without their commissioners, most of the objects in Commissions & Commissioners would never have existed. Commissions take a range of forms in the design world. Private individuals can order furniture for a specific house while companies can retain designers on the basis of a market strategy. How is an object made? The making process and the search for new materials and production models are often just as important for designers as the result. Some objects in Making Matters illustrate key technical moments in design history, others are the result of expertise in a technique and the perfecting of that technique until it becomes a trademark. What curious stories do objects tell? The pieces in Curiosity cause astonishment and act as conversation pieces. Some objects tickle our curiosity as a result of their remarkable appearance or of their unusual function. Other pieces are outsiders in the collection or came into existence in a quite peculiar manner. When is an object socially or ecologically responsible? Responsible Objects shows objects that emerged as ‘do-gooders’ out of the social engagement of their designers. There are examples throughout history of quality furniture made for the middle and working classes, DIY design and ecological design strategies such as recycling and local production methods. How do children look at design objects? Seven children explored the museum collection and chose an object that spoke to them in particular. Listen to their stories and look at the objects in Object Stories through another perspective! Taking the booklet I see, I see what you can’t see as your guide, you can discover ten objects in the exhibition with children in a playful manner.